Sherry. No it's not a grandma's drink and no it’s not always sweet. 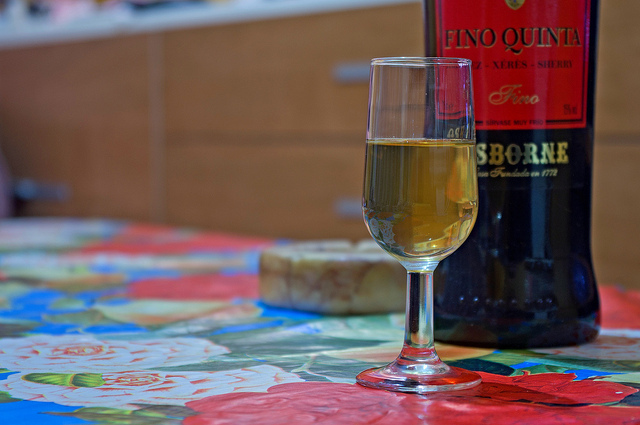 In fact, many styles of sherry are indeed bone dry and perfect as an aperitif or for drinking throughout the whole meal. And really, really excellent with cheese. Sherry is from Spain. Jerez to be most exact. The base wine for a dry Sherry is made with a grape variety called Palomino. It is a variety that oxidises quickly, is low in acid and low in sugar. So not the best for table wine but perfect for sherry. After fermentation, this base wine is fortified with grape spirit, ie pumped up with alcohol. For Fino and Manzanilla to 15. Then it is put in barrels for ageing. The next bit of Sherry making is a little bit more complicated but a very condensed version goes a little something like this: The barrelled wine develops a yeast 'flor' covering the top of the wine protecting it from oxidation (except for in the case of Oloroso). The barrels are stacked in a 'solera' system where the new wine goes in on the top level barrels, and the oldest wine is on the bottom. With age, the barrelled wine evaporates, so the bottom row is topped with the row above, and so on and so forth. The older the sherry, the nuttier, darker and more complex the wine. It's very pale, very dry, clean and not too complex. They can be crisp, yeasty, fruity, floral and definitely salty. Average age in barrel is 5-7 years, which can give subtle hints of nuttiness but not always. It’s a delicate style of Sherry and it’s drunk comparatively young to the other dry styles. Try: Navazos Fino en Rama Sacha de Mayo 2015, £10 (there's a list of stockists on Wine Anorak); it’s a great place to start or La Bota no 54 Fino 'Marcharnudo Alto' (£35, BBR) for a slightly more full-bodied Fino. Fino and Manzanilla are basically made in the same way the only difference being that Manzanilla is produced and matured closer to the sea. So expect similar flavours to Fino and a super light colour but a touch more salt. Try: La Cigarrera Manzanilla (£10.50, Devinos) for a something a little floral and clean or Mira La Mar Manzanilla (£6.95 per half, Davys Wine) for something a little more yeasty, nutty and olive. For a step up in complexity…Amontillado will hit the spot. This wine is aged like a Fino then it loses it’s protective flor. It is then then refortified to protect the wine from too much oxidation (a little bit is ok though). It’s darker with hazelnutty, almondy, and caramel characteristics with the doughy, salty base of Fino. It's more a concentrated tipple and golden in colour. Try: Bodegas Baron Micaela Amontillado £13.75 or Xixarito Amontillado £27.45 for an explosion of hazelnuts, salted caramel and a long, long, long finish. Both available through Morgenrot. (Their whole range is worth a look- aesthetically and taste wise..) If you can't get hold of them, try the Romate Maribel Amontillado for £8.50 from The Wine Society. Oloroso is so rich, nutty, sweet spiced and concentrated that it can sometimes be mistaken for something sweet especially on the nose but don't worry it's still dry. Deeply amber coloured and super oxidative with a mouthful of flavours. Try: Williams and Humbert Collection 12yr old (£8.69, Waitrose). It has everything all of those rich flavours you should expect from an Olorosso. Or for a special treat with a block of dark chocolate try the Harvey's Rich Old Oloroso V.O.R.S. (£24.06, The Drink Shop), it will blow you socks off. And the rogue one... Palo Cortado. It’s the rare and mysterious Sherry and it is somewhat made by mistake. It starts out on the journey to become a Fino or an Amontillado then for some reason the flor breaks down. What you need to know is it's somewhere between an Amontillado and an Olorosso and it's complex and delicious. Try: Harvey's Palo Cortado (£22.59, Waitrose), with a plate of iberico jamon. Sharing recommended but understandably difficult. Rich and hazelnut with a finish that lingers for days. And Majestic sells a very lovely Pedro's Almacenista Selection Palo Cortado for £14.99.